Life is a sum of all choices that we make. There are people who enter our life with some reasons. It's our job to decrypt these reasons. There are many who inspire us in some or the other way. The best thing that we could do is to learn from others. Learn from them how they managed to make it large and big! These small stories that we learn from others life only makes us stronger and lightens our inner will to do more. Many people can inspire you. It depends on how you perceive things. It could be a beggar walking down the lane or a struggling salesman trying to sell his product. It could be anything and I am sure you all know the story of the Spider. We all know how King Bruce learned the greatest lesson of life through a spider. Try and Try till you succeed is what the spider taught him and in turn he inspired us through this age old adage! Today I would be narrating you about someone who inspired me and whom I could proudly call as my role model. When I was young, I used to be a brat. I never listened to my parents. My mother would be vexed at me because I would never listen to her. My father would be annoyed too. Those were the teen days! I was just 15! We had a lesson called - 'Airborne to Chairborne' in our class 10 English Curriculum. I seemed disinterested when our teacher started with the chapter. I just took it casually just like another boring lecture. But when I started paying attention to it, I realized that this man is a brave-heart! His life took a 180 degree turn in no time. I am talking about Air force Pilot Anil Kumar who had lots of dreams in his eyes and ambitions. A major road accident changed his life upside down. That gory road accident left him paralyzed below his neck. He was a great writer and a vivid reader. Because of that accident he couldn't use his hands and limbs anymore. Imagine living a life of a torso with good pairs of legs and hands. Indeed! God never showed mercy upon him. 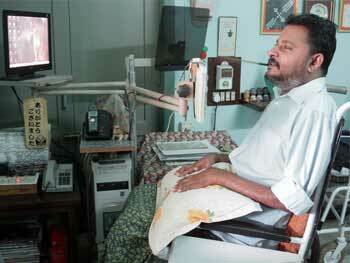 Indian Air force was kind enough and sheltered him in the Paraplegic Rehabilitation Center in Khadki. The road accident confined him to a wheel chair. Imagine yourself in such kind of a terrible situation. You would know the pain if you were to wear his shoes. Many time in our life we have everything and still we crib about many things. Mr. Anil Kumar made me cry through his essay when my teacher narrated his story. Tears rolled down my cheeks when I learned about his plight. THOUGH disabled, he never gave up. He wrote books and ensured that he gave time for his passion. 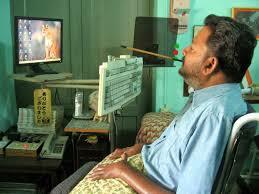 The Indian Air force was generous enough to gift him a computer which he operated by holding a pencil between his teeth and sometimes using a stylus. It was 11 years ago when I first read about him. He changed my life to some extent. I used to be a careless young boy of 15 but after reading his life story, I realized that life is too short. In this short span of life that we live, we need to accomplish many things. Some of these things matters us while some things don't! I told his story to my mother that same night. I seem to be disturbed. I wanted to do something. I accepted him as my teacher and moved ahead in life. He motivated me through his story. He taught me the most valuable lesson of my life - to lit up your dreams even if you are in darkness. This lesson is one of the most precious gift that I got by knowing him! Many people get disheartened by small things. Losing your arms and legs in an accident is a sad thing. Having arms and legs that don't function at all is even more disheartening. Anil 'Sir' taught me through his story that there may be many hindrances in life but we should not succumb to pressure and fall! Never give up! You may fall many times in this journey of life, but do remember that you are special and have faith in your abilities. 10 years later I was posted to work at Pune location. I had an opportunity to meet him at the Paraplegic Center in Khadki. He was a humble man. He had a smiling face and greeted me with a smile. I narrated him how he inspired me and told him that he was my role model. He smiled at me but some how I could see a silent invisible tear rolling down his cheeks. His positive outlook towards life struck me hard. Whenever I felt low and sad, I make sure I read an excerpt of his essay. "Believe it or not, every dark cloud has a silver lining. To surmount even seemingly insuperable obstacles, one has to muster the remnant faculties and shun the thought of disability and then canalize one's dormant energies purposefully and whole‑heartedly. It isn't just physical ability and average intelligence but an insatiable appetite for success and an unflagging will power that would texture the warp and woof of the fabric called human destiny. Greater the difficulty, sweeter the victory." Never let yourself down even when you are immersed in deep sorrow. Its just a phase of life, everything will be alright and fine. Its just a matter of time. Believe in yourself that you would do something big. Never let your weakness dominate you and break you into shards of pieces. If you do, then life would be full of disappointments. Learn from life for it is the greatest teacher. Destiny can change your life any instant just like it changed Mr. Anil Kumar's life upside down within a matter of time. Such is life! You can never predict it! My role model not just teaches me great lessons but also teaches me to conquer the world, overcome your difficulties and weaknesses with a smile. This smile is enough to suppress everything. Smile when you are low, Smile when you are happy, Smile during your difficult times, Smile whenever possible, Service with a Smile! 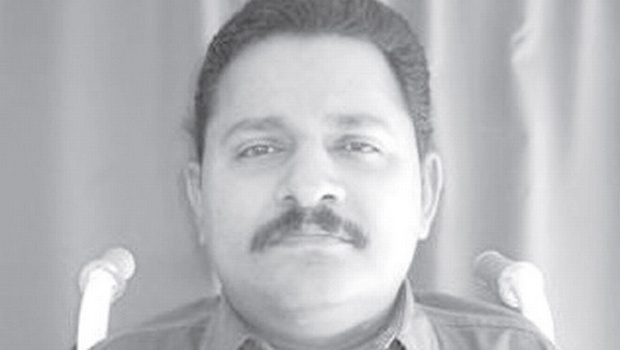 Anil Kumar, through his life teaches us many valuable lessons. His essay is popular amongst many people especially students. It was a part of the Maharashtra board 10th Std syllabus for a considerable period of time. Many people used to get inspired from his life and would visit him periodically at his home in Khadki. Even I promised him that we would meet again. But sadly, I received the greatest shock of my life when I learned that he passed away on 20th May, 2014. I cried badly when I got to know about his death. I just prayed that Almighty shield and guard this angel near him. It seems he was suffering from cancer and he finally succumbed to it. Lord God, he is one of the best person whom I met in my life. Through his life, he inspired many like me. I thank him for all the inspiration that he had to offer through his story. You would always remain special in my heart, Sir! Everyone's life is full of pain,lets not lose to it. Overcome the pain and lets win over it. He was a fighter who fought through out his life against his disability to prove everyone wrong.Disability should not break your soul, in fact it should strengthen you into a stronger being. He lived his life with a smile and inspired many! Thank you bro! You should read about him! Reallly nice one i loved it!!! Speechless. At how you have put up his story. Its touched the core and pulled the strings. Nice writing!